Keeping an eye on stylish design helps one maker to be competitive. Taiwan’s furniture industry was also shaken by the global downturn in 2009, turning out only US$1.359 billion of furniture and related products, compared with US$1.680 billion posted in 2008, according to statistics from the Taiwan Furniture Manufacturers’ Association. Despite the global economic recovery, the furniture hardware sector in Taiwan is rebounding with less momentum in 2010 than sectors as high-tech and other globally competitive traditional manufacturing industries as hand tools, machinery and auto parts. However many industry insiders are optimistic about 2010, especially the ones who were forced to shut down operations or lay off staff in early 2009. The following four furniture hardware makers talk about their survival strategies, means to sharpen competitiveness, and adaptations amid challenging market conditions in recent years. Four Winds Corporation is an ODM (original design manufacturer) founded in 1978 and headquartered in Taipei, northern Taiwan. Initially an OEM (original equipment manufacturer) of parts and accessories for low-end furniture, the company has focused on sustainable development, consistently cultivating R&D capability over the past decades through learning-by-doing, according to the president Marcellus Shen. Exporting most of its output globally as ODM, this maker offers furniture hardware and fittings, including slides, locks, various hardware as shelf fittings and swivels, catches and latches, hinges, sliding and folding door fittings, utility hooks, mirror fittings, handles and knobs, decorative hardware, casters etc. Also notable is that the company supplies own-brand products, having built footholds in a number of countries. Religiously believing that furniture also enhances lifestyle, Shen says that his company develops each piece of furniture hardware with an eye on style, designing even mundane parts to differ from competitors’. 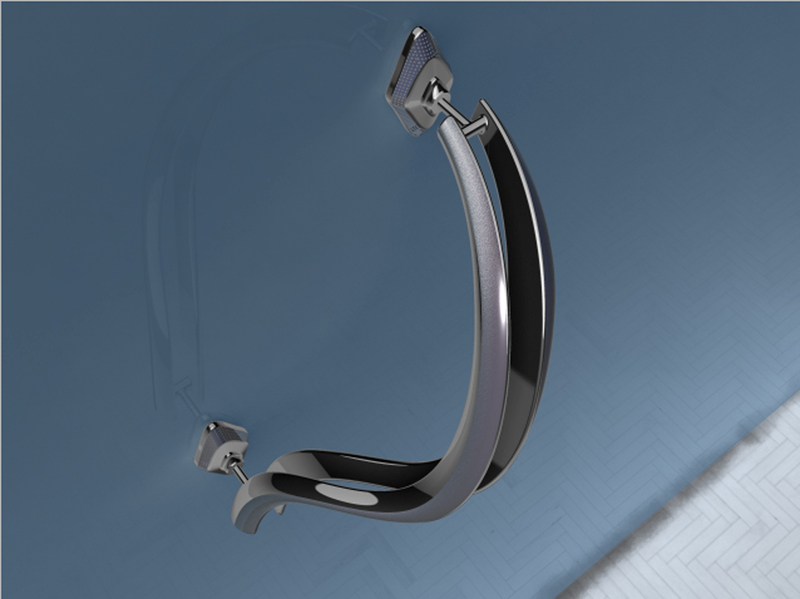 Showing his company’s hot-selling decorative handles, Shen says that each one is made of aluminum alloy and precisely lathed to render integral form, blemish-free surface and compactness for attractive aesthetics. In fact the series are regarded as luxury hardware in some markets for their amazingly deft craftsmanship. Also proud of the company’s casters, Shen says that they are mainly for use in household and office furniture, all featuring optional colors and materials to meet different user demand. The FMF75 slim twin-wheel caster, for example, is noted for its stylish design with colorful body made of specially processed material that is also durable. Although more expensive than typical casters, they are perennially popular among the company’s products. A maker renowned for its consummate manufacturing capability is Shen Shan International Glide Mfg. Corp., established in 1981 in Taichung, central Taiwan. 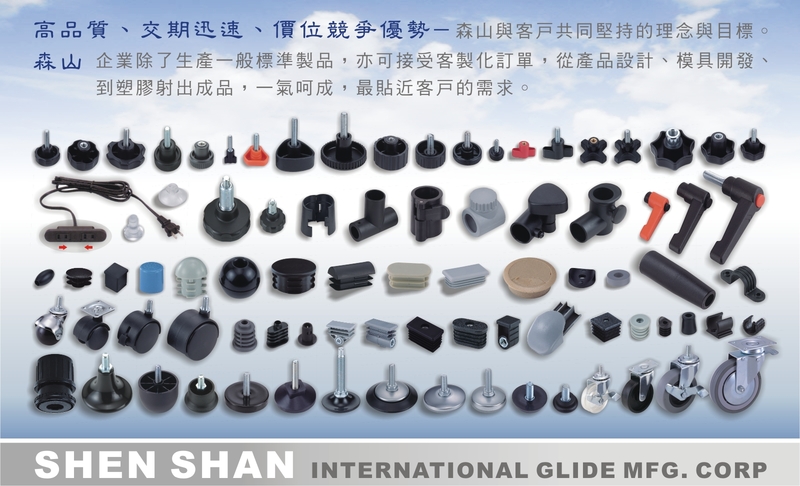 Having been producing plastic injected furniture parts for nearly 30 years, Shen Shan supplies a variety of plugs, casters and related accessories, as well as a series of hardware, which are exported to Australia, the U.S., Germany and Canada. The managing director Wu Sen-mao says that Shen Shan has built a solid name as a competent, reliable manufacturer in Taiwan, which has consistently focused on improving production capability, manufacturing and warehouse equipment. In addition, Wu stresses that having in-house molding capability is also a competitive advantage, which helps to boost production efficiency and flexibility to stay ahead of rivals. Besides, the company is noted for having ample knowledge about material characteristics of industrial plastic, including PVC and PE, says Wu, emphasizing that the company is therefore capable of advising customers at every stage of a project, playing a key role to help customers stay within budget, achieve optimized product performance, and tweak product characteristics to suit different markets. Showing its diversity as a world-caliber supplier and building its profile, the company has ventured into producing healthcare hardware and related accessories, which call for more advanced production technologies and facilities. Wu says that the company’s devotion to enhancing manufacturing is a way to win customer trust, adding that Shen Shan has created mutually beneficial partnerships with customers, making the firm able to weather the tests of economic cycles and industrial changes over the decades. Established in 1988 in Changhua County, Meng Nung Enterprise Co., Ltd. is a furniture hardware maker known for above-average R&D capability. Supplying a wide range of furniture hardware and parts, including handles, storage racks, towel racks, tissue holders, and aluminum alloy parts, the maker exports most of its output to Singapore, Japan, the Philippines, Germany, Italy, and the U.S., according to Chen Ching-mu, the proprietor. “Price competition is tough for us these days and Chinese makers are formidable at the game,” says Chen. To counter this problem, the company is adopting a popular strategy by moving upmarket, producing not conventional, low-priced items but high-end aluminum alloy hardware and parts. The belief is that underselling Chinese makers typically lack the know-how, facilities to turn out high-grade items. To that end, the company has spent several years and considerable resources studying such alloy and related processing technologies, says Chen, adding that “processing such metals requires a lot of know-how and defects are hard to detect until you’ve finished electroplating.” Failure to see defects in time, of course, adds to the cost of manufacturing. The firm uses special surface treatment to render aluminum-alloy furniture hardware stylish and streamlined, making them suitable for decorative hardware on merchandise display racks. This is the reason behind the product line’s long-standing popularity. “Compared with foreign rivals, Taiwanese furniture hardware makers have a competitive edge in quality, production, and price. And demand for furniture exists everywhere, so as long as we follow trends closely, we’ll always find market niches,” says Chen. With a history of about 25 years, Chang Mei Co., Ltd., established in 1984 in Changhua County, is a veteran supplier of brass handles and knobs. 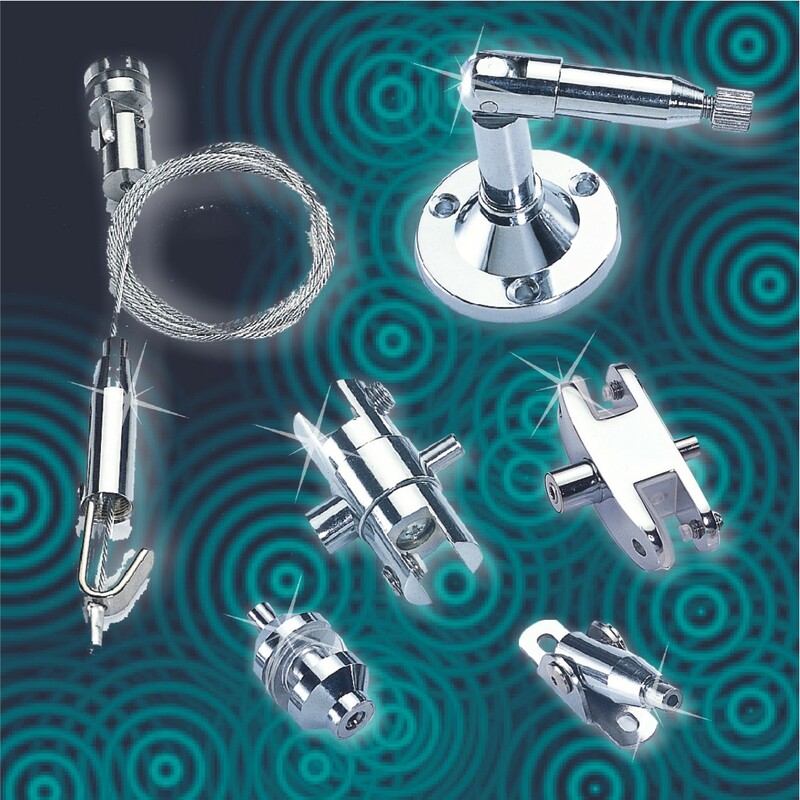 Since its inception, the company has been an OEM specialized in cabinet knobs, handles, legs, towel hooks and related accessories, over 95% of which are exported to the U.S., Europe, Japan, Australia and Latin America, according to the president Yang Lien-chu. To maintain competitiveness, Yang says that the company has worked with colleges and universities to research applications of material formulas, such as zinc alloy and aluminum alloy. Also the maker is eco-sensitive, improving processing technologies to be eco-friendly and turning out hot-selling handles without lead content. In addition, the seasoned maker has completed integration of production lines in- house to enhance production efficiency and flexibility, setting itself apart as a supplier who cares to improve the status quo. “With integrated production, Chang Mei can more effectively control product quality than before, without having to outsource production that can be unreliable, to win customer’s trust as a capable supplier,” says Yang.